I've just sat and read David DuChemin's new eBook Making the Image cover to cover in one sitting. My initial reaction is that this is a great book for outlining the thought process that goes into making photographs and will appear on my must-read list. My second reaction is that this is a book that I wish I had written, notwithstanding the fact that I'm not near as as eloquent, passionate and prolific a writer as David is! So much of it resonates with how I work and the conversation that I have when I am photographing. Indeed, I have written several blog posts which I also titled "Making the Image" which outline how I go about making photographs whilst on location. If you follow me here, on social media or - gasp! - know me in real life, you'll know that I'm a huge admirer of David DuChemin. Whilst most point to the likes of Ansel Adams or Joe Cornish as their inspiration (for me too they were my encouragement to pick up the camera) I'd shout out David as one of my heroes for saving my photographic life. Like millions of others I'd fallen into the trap of thinking that it was my equipment that was letting me down. Daily visits to the likes of DPReview convinced me that a new camera or new lens was my photographic saviour. I stumbled upon David's blog by chance years ago when it was much smaller than it is now. What he said clicked with me immediately "Gear is good, vision is better". My lacking as a photographer had less to do with my (now very expensively assembled) gear and everything to do with me (and remains so to this day). His blog has always been full of passion, challenged my thinking, and focused on the mindgames of photography. It was never instructional in an absolute sense, he didn't say "do this" or "do that" as other blogs and books would do. It was always questioning and challenging. The answers - though admittedly heavily implied - were left to the reader to decide for themselves. So it is with Making the Image. This book isn't about telling you how to take better photographs. More it outlines a process that you might go through to make better photographs. Focusing on the journey, rather than the destination as it were. For a long time now I've considered photography to be a conversation, between the photographer, the camera and the landscape. It might sound silly to non-photographers, but I see it as an ongoing process of observation (listening), questioning, and personal interpretation (talking). The joy of digital technology is that the immediate feedback on the LCD allows that conversation to happen much more fluidly. "How do I feel about this photograph?" "How can I make it stronger?" This ongoing interrogation results in a very iterative process, where I reach my best photograph step-by-step. Sometimes I'll take a wrong turn and go down a blind alley, but that's all in the name of trying something, failing, and learning. Sometimes the first image I make is the best, sometimes the last, and sometimes it's one somewhere in the middle. But each step (or image, whether I press the shutter or not) is taken in answer to a question I have posed myself. I share this approach when teaching workshops, trying to encourage the questioning mind rather than relying on absolute truths. Those truths simply don't exist from one photograph to the next. There is no universally best exposure, composition, aperture, focus point, shutter speed, ISO, filter combination, focal length, position, and so on. It's all these variables and more that create an individual photograph and perhaps even an individual style. It's up to the photographer to put the jigsaw puzzle together that best represents what we have in our head. Making the Image is laid out like the conversation that is so often going on in my head. It clearly outlines all of this thinking through a series of questions, each of which considers a different aspect of the photograph and how certain aspects might support or detract from the photograph we have in mind. From "Why do I want to make this photograph?" to "Can I further simplify the image?" to "How is the image balanced? ", it provides not so much a framework - you wouldn't sit down and go through these from start to end on every shot - but a pool of inspirational questions to draw on when you're not sure where to go next. Sometimes it well help to get unstuck, other times it will open up a new creative avenue that you hadn't considered. Better yet, if you use and practice the questions over time they will become ingrained in your own photographic routine. It even comes with a Quick Reference guide of just the questions so that you can keep them close at hand. Rather than just dump the questions and run for the hills, for each question David talks through one or several of his own photographs and shows how he applied the questions in his own approach. This really helps ground the questions, taking them from a perhaps abstract idea to pragmatic advice you can relate to your own photography. As I say, the book strongly resonates with how I approach my photography and my teaching. I think most photographers will find something to learn here, even if affirmation of your own approach (powerful in itself). For myself, with someone else presenting these ideas and questions back to me, it has helped me think further and more clearly on my own process. There's even a few extra questions which may have been in my subconcious that Making the Image has helped bring to the surface. I expect to hear David's voice on my future photographic adventures (which could get a bit weird at times). The blurb for the book asks "Have you ever wanted an experienced photographer to look over your shoulder once in a while and ask you why you're doing this or that, and whether you'd considered trying something different?". Normally I find there's an expectation gap between the marketing and a product's reality. On this occasion I think the marketing for Making the Image is good to it's word; that's exactly what this book feels and reads like. A good teacher won't just tell you the answers, they'll help you to understand the process for yourself. That, as I found on his blog all those years ago, is where David excels. “A wise man doesn’t give the right answers, he poses the right questions. ~ Claude Levi-Strauss. This quote from the inside cover of the book gives a strong clue as to the book's contents. Everyone that picks up Making the Image before August 12 at 11:59 PM (PDT) also gets a chance to win one of three portfolio or image reviews with me. This gives me a chance to connect with a couple more of you, and gives three of you a chance to go a little deeper with your own images and process. No restrictions, no fine print. Everyone that gets Making the Image before August 12 at 11:59 PM (PDT) gets a great resource for 20% off what I hope is already a really great price, and a chance to win some time with me. Note that Dreamscapes are running a Spring Sale - 15% off this and other books if you use the code SPRING at checkout until the end of April. Though I've bought many photography books in my time, there aren't many that covered the critical area of composition particularly well. Sure the usual suspects - rule of thirds, leading lines, and the like - all made an appearance but to my mind they are only useful to start the mind thinking about composition, and don't deal with creating more original and complex compositions. When Ian Plant launched this book I was very interested, a book dedicated solely to the subject. Though it's an eBook, it's on a different level to many other eBooks which are often content-light and little more than extended blog posts. This is a long eBook, meticulously put together, very well illustrated, and containing highly original content. Ian talks briefly about the rule of thirds, etc and where they came from including the value that they do have, before talking about how they are relatively blunt instruments and so though well meaning, we need to turn our back on them to progress beyond relatively simple and contrived compositions. Through the rest of the book he uses examples from art through history to explain many of the key principles (vs rules) that lead to stronger composition, and provides some structure for using these principles in the field. Many of the ideas in this book have stuck with me in a way that other books have failed. To me it's the most thorough and also understandable text on composition I've come across, with lots of good examples and thinking to get the brain ticking. It just works. A very worthy read, highly recommended! When I was a lad, photographically speaking, Understanding Exposure by Brian Peterson was pretty much always recommended to those new to using the camera creatively. I’m not sure if there’s something wrong with me but I didn’t really get on with it. Perhaps my mind has been fogged by time or I wasn't ready for it at the time. Obviously others think it’s great, but it’s not a book I could recommend based on my personal experience. So I’ve been on the lookout for an introductory book covering the fundamentals that I could recommend to workshop participants and others starting their journey. 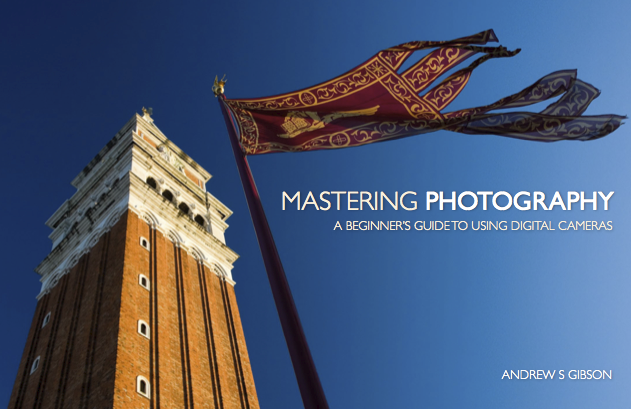 Several weeks ago Andrew S Gibson released an eBook called Mastering Photography which claims to do just that, so I thought I’d give it a look. Note this post includes affiliate links which means I receive a small payment for any purchases made via my site. It's by no means megabucks so it doesn't affect the objectivity of my reviews! Andrew released a near identical book last year called Understanding EOS which is the Canon-specific version of this book. The same comments as below apply with more specific instruction on operating a Canon camera. If you're a Canon-user and want to buy the book, then buy Understanding EOS instead. As a slight aside I think the name of the book could be a little more modest. To my mind mastery isn’t something that you can learn from this or any number of books (my bulging bookcase is testament to that!). It’s a result of years of practice and experience (and lots and lots of failures). It’s only a minor quibble and in fairness a less bold title would be unlikely to attract attention on a noisy internet, but I thought I'd mention it in the interests of expectations management. The book opens with a discussion of what Andrew calls the 'Creative Triangle' - Composition, Lighting and Technique - and I like that from the outset he sets the tone that there's more to making a great image than just camera skills. The book mostly covers the Technique corner of the triangle, likely because without technique and understanding of our equipment we will struggle to explore the other components creatively. I'm hoping that Andrew will release future volumes to accompany this one to complete the creative triangle. We're then shown a number of inspirational images with the back story and the photographer's thinking. I always enjoy reading these and find them helpful. Personally the thought of the wire wool burning shot terrifies me (yes I'm a scaredy cat!) so perhaps a more accessible image would've been better. Nonetheless it's a lovely image and certainly serves the purpose of inspiring! There are further illustrated examples throughout the book explaining the thinking that went into each. We're then into the guts of the book - how to get off of Auto mode and start using the camera more creatively. We start fairly logically with the 'exposure triangle' - aperture, shutter speed and ISO. Here I think Andrew does a great job of explaining these and the relationship between them in a way that I was looking for when I first picked up the camera. He uses good examples to illustrate the effects and he doesn't just talk about what they are, but more importantly how to use them creatively and some of the decisions involved in doing so. Related to this is how you use the less-auto modes of your camera - programmed auto, aperture priority and shutter priority - and that's well covered too. If you've been struggling to understand the effects of aperture, shutter speed and ISO and the relationship between them required for a good exposure, then I think this will be of help to you. There's then a discussion of in-camera Picture Styles which is useful if you don't intend to post-process your image on a computer. Personally I encourage people to do their own processing as I think it's a key part of image making. But for anyone that feels a little overwhelmed starting out, understanding Picture Styles can certainly help to reduce the number of things you have to worry about and it's well covered here. White Balance and Histograms - My Favourites! The book then covers White Balance, and I was particularly happy to see Andrew discuss the merits of using WB creatively. For me white balance isn't about making whites white, but a key control in conveying mood in images. Andrew explains WB well and includes some good examples that show the effect of different WB settings. There's an explanation of Histograms and I've discussed my love for them on this blog before. They can be a little intimidating at first so this is a good read if you need to get your head around them. Finally there's talk of Colour Management. Many find this a daunting subject (including me! :)) but he's right to highlight its importance. I'm not sure it's a key concern for the beginner photographer, but it's certainly an important - and in truth relatively straightforward - step to perform as you improve. "You won't become a master just by reading a book but it's certainly a step in the right direction." And there we have it. Pretty much all of the key things you need to start using your camera more creatively are covered here, with good examples and good explanation of the exposure choices made by the photographer. While much of this information can be found on the internet it's not presented as clearly and beautifully as here. It's certainly the sort of resource I wish I had when I was starting out. You won't become a master just by reading a book but it's certainly a step in the right direction. Given it's also only £7 it's certainly one that I'll be recommending to people in the future. Even better if you use the code july2 by 31st July it's only £5 - bargain! You can get the book here. Remember if you're a Canon user you want to get Understanding EOS instead. I will announce all of my workshop dates via my newsletter and places will be filled on a strict first come first served basis. If you're interested in joining me on an image making adventure then please sign up to my mailing list. Don't miss out! You can find a list of my current workshop dates here. I am also available for 1-2-1s and online tuition, details of which you can find here.